To highlight the strengths of NEXCOM’s transportation computers and its domain know-how, NEXCOM is going to demonstrate a variety of applications including train surveillance, PIS (Passenger Information System), train traffic control and radio communication, and smart bus at InnoTrans 2016. Be sure to visit NEXCOM's booth #203 in 4.1 hall. The exhibition takes place from September 20th to 23rd in Berlin, Germany. At the show, NEXCOM will map out a clear application diagram for each application helping visitors understand how NEXCOM’s transportation computers can be applied to different scenarios. For example, with the aim to strengthen public safety and security, NEXCOM will propose train service operators a video surveillance system for use on trains. The system, which integrates NEXCOM transportation computer MVS 5210, an array of IP cameras, and vehicle mount displays VMD 3002/2002, will enable operators to conduct an extensive monitoring of onboard activities. Outside the train, cameras integrated with vehicle mount computer VMC 3011-RAN, PoE switch VES30-8S, and industrial storage iNAS 300 will be featured to demonstrate train-pedestrian and train-vehicle collision prevention, and storage of data records. Visitors are also going to see the latest and highly popular platforms such as PIS system VTC 7220-R used in passenger infotainment, nROK 1020 in train radio communication, nROK 5500 in train traffic control and in-vehicle computer VTC 6210 in smart bus. 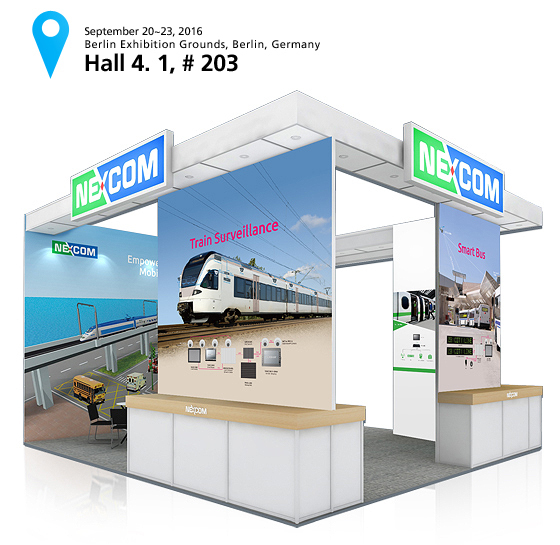 To learn about NEXCOM’s four applications and more, please visit NEXCOM's booth at InnoTrans 2016.